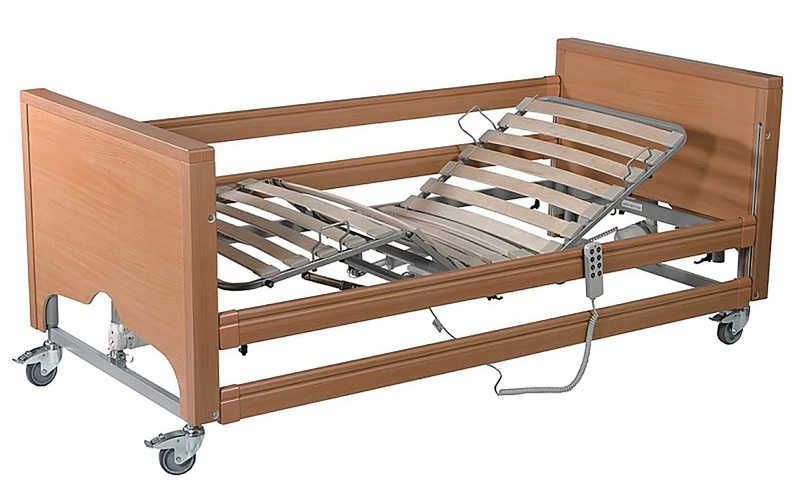 This care bed with side rails is a modern take on a electric hospital bed. It has beech panelling to hide the metal frame and can be raised to a height of 80 cm. The Care Bed with Side Rails is made to look attractive with a less clinical finish than a traditional medical bed. Its motors are hidden within the design, and the beech panelling hides the metal frame. The bed can be raised to a height of between 40 cm – 80 cm which gives nurses and carers the opportunity to tend to users successfully without bending and getting injured. This Care Bed is extremely robust and can be dismantled and reassembled making cleaning simple, thus reducing the risk of infections. A handset, which is lockable, can be placed within easy reach of the user. It is simple to control and can be set to the optimum position for everyone. For extra safety, all cables are attached to the frame to avoid any slip or trip hazards. This also means that any hoists or turn aids can be placed next to the bed for easy access. An option with low side rails is available. The low positioning of the side rails provides a safe environment for those at risk of falling out of bed to relax without worry. Colour options include Oak, Maple, Walnut, and Beech.